How much has the Brexit cost? How could we use the money instead? By Hanna Pamuła - PhD candidate and Jack Bowater. Why did the British people vote for Brexit? Wondering what the money lost in growth since the UKs decision to leave the EU could have been spent on? 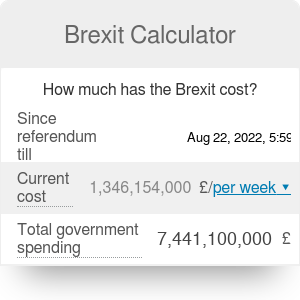 Well, look no further with our Brexit Calculator! Also feel free to check our Trump's Wall Calculator. Ever since that fateful vote on the 23rd June 2016, the United Kingdom has been in turmoil. The pound fell over 11 % when the results of the referendum were released, and it still has not recovered. At least €600bn in banking will leave the City of London for other, more stable shores. The housing market has come grinding to a halt, jobs all across the country are at risk and foreign capital coming into the UK has dropped dramatically. But at least warehouses are thriving while everyone stocks up, like the end of the world is coming! 20/7/2016 - May visits Angela Merkel in Berlin, stating that the UK wishes to keep the "closest economic links" with the EU. May also said she would not invoke Article 50 (the means by which a country can leave the EU) during 2016. 17/1/2017 - May outlines the aims of Brexit in a speech from Downing Street. This included, the UK's departure from the single market (a necessity based on her stance during the Conservation leadership election), leaving the customs union while still wanting tariff-free trade with the EU, the desire to avoid a “hard border” between Northern Ireland and the Republic of Ireland, and the need for some kind of transitional period when Brexit kicked in, amongst other things. 2/2/2017 - The White Paper is released by the government, formalising what May said in her 17/1/2017 speech. 29/3/2017 - Article 50 is invoked, meaning the UK will leave the EU in exactly two years. 18/4/2017 - May calls a snap election, something she had previously ruled out, with the aim of strengthening her hand when it comes to Brexit negotiations. 8/6/2017 - The general election is held. The Conservatives lose 13 seats and with that their majority. A hung parliament occurs until the Tories form a coalition with the DUP (Democratic Unionist Party). 19/6/2017 - Brexit Secretary David Davis arrives in Brussels, marking the beginning of negotiations for a deal. 22/9/2017 - In Florence, May gives her speech on the nature of the transitional period, and promises to continue funding EU security and science projects. 19/3/2018 - The transition period was agreed, and a document is published showing 75% of the deal has been agreed upon. 14/11/2018 - Text of the withdrawal agreement is published, including provisions for a “backstop” with regards to the Irish border. 15/11/2018 - The Brexit Secretary, Dominic Raab and the Work and Pensions Secretary, Esther McVey, resign over the deal. 25/11/2018 - The EU endorses the Brexit deal. 12/12/2018 - May survives a vote of no confidence. 15/1/2019 - The House of Commons votes down the Brexit deal, 432 to 202. 11/3/2019 - Deal is renegotiated with the EU, making sure the that the backstop is temporary. 12/3/2019 - Second vote on the agreement is voted down, 391 to 242. 13/3/2019 - The Commons voted against leaving the EU without a deal in a non-binding agreement, 312 votes to 308. 14/3/2019 - Motion passes by 412 to 202, delaying the Article 50 negotiating period. 18/3/2019 - Speaker Bercow says May cannot have a third vote without significant changes, triggering a constitutional crisis. 20/03/2019 - May asks EU Council President Donald Tusk for an extension on Brexit. Extension is granted to, at the earliest, 12th April. 25/03/2019 - Parliament, by 27 votes, grants itself more power to decide the outcome of Brexit. 29/03/2019 - The day the UK should have left the EU. 30/03/2019 - Despite promising to resign if the bill passed, May's third 'meaningful vote' fails, 344 votes to 286. 03/04/2019 - MPs pass, by one vote, a bill to force May to ask the EU for a further extension. 11/04/2019 - EU grants the UK a further extension on Brexit, until the 31st October. Spooky. That brings us up to date with the current Brexit proceedings. To see what may happen to the UK, check out our future section. For those of you that aren't British, and indeed some of you who are, it may be difficult to understand why a majority of British people chose to leave to EU. It would be impossible to create a full list of the reasons why people voted out, but it can be broken down into the two most important issues voters cited when questioned on the day of the vote, British sovereignty (32%) and immigration (48%). There is also the idea that the campaign dedicated to keeping the UK in the EU (Remain) did not do enough to sway public opinion against the movement for Brexit (Leave). Brits make no secret, and are sometimes proud, of their self-imposed distinction from the continent. The British often speak of “Europeans” like they themselves are not European, that the channel somehow makes their fair isles a continent of their own. This distinction is not just a linguistic quirk, but a political one as well. Eurobarometer data shows that the British don't consider themselves very European, having always come among the countries least likely to say they are attached when answering "How attached you feel to Europe?" (The UK came 4th from bottom in both Autumn 2014 and Autumn 2015.) Why? It is difficult to say, maybe that thin strip of sea called the Channel really does make all the difference, geographically speaking? Maybe this ideology is left over from the Empire, where Britain ruled over an area greater than Africa? Who is to say, but the fact is that the British do not consider themselves European. One of these may be the reason why Brits do not like the imposition of laws from Brussels. The British have a long history of the ideas of liberty and sovereignty, dating back to the English Civil War, and the perception that the UK is not in control of its laws is seen as a great affront by some. That those EU laws have only the ultimate authority in areas that all its nations have agreed to, was perhaps not talked about by the Remain campaign. There is also the idea that the EU is run by bureaucrats that cannot be elected and, despite having total control on UK law, never pass any laws. Although they are not elected, the EU Commission can be dissolved at any time by the EU Parliament. And it is true that every nation in the EU has a veto, which they use to ensure they are not getting the short end of the stick. That they sometimes use it for more selfish reasons is true; however, no one is saying the EU is perfect. The most significant reason voters said was the influx of immigrants. Although immigration has been occurring in the UK on a large scale since the beginning of the post-war period, the amount has increased significantly since the end of the 1990s. There was a prevalent idea that immigrants were coming over to the UK just to use the NHS and the school systems. This was enough of an issue for David Cameron, the previous Prime Minister, to renegotiate the terms of UK membership to the EU in 2015-16, putting in place a four-year wait until EU immigrants could use such systems. It is also worth noting that The Economist noticed that Leave voters were the majority in 94 % of places that saw over a 200 % increase in foreign-born population between 2001 and 2014, i.e. that people were more in favour of Leave when the increase in immigration was more noticeable. This, coupled with the refugee crisis that many people saw as a "hoard of refugees that are coming to our homeland that the EU is mandating we accept". This last point was, expectedly, exaggerated by the right-wing media to become a point of fear for the average person, as the UK accepted very few refugees when compared to say Hungary or Sweden. It is also possible that some people believed that leaving the EU would reduce the number of immigrants from non-EU countries, something which would not occur. So, why was the Remain campaign so weak? Maybe the mentality was that people would choose the evil they know rather than the evil they don't, that the Leave argument was so weak that they didn't need to do anything. Labour leader Jeremy Corbyn only appeared to give lip service to Remain. The only thing necessary for the triumph of evil is for good men to do nothing. Although which future the UK is going down is murky, there are only 4 available options, and it all comes down to Ireland. Before we look to the future, we must understand the past. The English have had an interest in Ireland since the Normans invaded in 1169. After a few centuries of on and off rule, the English kings finally decided to bring Ireland under more centralised control, and with this control came the spreading of their newfangled religion, Protestantism. Land from rebellious lords was confiscated, and given to English Protestants, to both cement control and spread the word of God. This system, known as the Plantations, was most successful in northern Ireland, known traditionally as Ulster. Tensions strained for many centuries, and centuries of repression cumulated in the Home Rule movement, which passed in 1914, just as World War I was starting. Home Rule was eventually enacted after a series of rebellions in the south, the success of which allowed the south to formed the Irish Free State, a dominion of the British Commonwealth, and then the Republic of Ireland, a sovereign nation. As the north was predominately Protestant and industrialised, in contrast with the Catholic and agrarian south, they elected to remain part of the UK as a separate entity to the Irish Free State. There was however a Catholic minority in the region, which was subject to political and social persecution. Their peaceful protests were put down brutally by the police, leading to the violence escalating, which broke into the Troubles, a guerrilla and bombing campaign between Nationalists, Unionists and the British Army. The Troubles continued for three decades and were finally ended by the Good Friday agreement, which amongst other things, established that there will never be a hard border between the North and South again. A hard border between the Republic of Ireland and Northern Island, a.k.a. No Deal Brexit - In order to ensure that full and total liberation from the EU is achieved, a hard border is put up between the two Irelands; all goods and people coming through must be checked and the appropriate tariffs paid for them (the goods that is). This leaves the UK completely free in every way from the EU, but what will this mean for the two Irelands? Smuggling will no doubt crop up around the border, as people look to avoid the tariffs and exchange rate between the pound and euro. The time lost waiting at the border will also be a big hit to the economy of both countries, with 25 % of the Republics exports going to the UK, and 5.3 % the other way. And what about the Good Friday agreement? Nothing stirs up old feelings of resentment like being turned away at the border when you go to see your family. Would peace reign, or would violence flare up again? No border in Ireland, but a border in the Irish Sea - No border is erected between the two Irelands, leaving Northern Ireland in the EU customs union while the rest of the UK leaves it. This means that tariffs and passport checks occur either as goods and people leave Northern Ireland or arrive at the rest of the UK. The UK is allowed to make trade deals with the rest of the world. Maximum Brexit is still achieved but at the likely cost of Northern Ireland. As intra-Ireland trade can still occur unhampered, but trade between the North and the rest of the UK is slow, Northern Ireland becomes closer and closer to the Republic and further and further from the Union with each passing year. The Good Friday agreement stipulates that unification can occur if both sides want it, and with each decade this looks more likely. No hard border anywhere, but no maximum Brexit - Trade and people can flow unhindered from Ireland to Northern Ireland to the rest of the UK, at the cost of concessions on the nature of Brexit. The UK remains mostly in the single market, the free movement of people still occurs, and some EU laws still apply. People ask themselves, "Why did the UK go through all this trouble just to stay in the EU, mostly?" The UK does not leave the EU at all - Either a second referendum is held, or discussions with parliament go nowhere, the UK keeps asking the EU for extensions on Article 50, and the EU keeps granting them. This continues until one of the options above occurs, or one side asks the other if Brexit can stop. Instability and unpredictability are the orders of the day for the entirety of this process, and the many businesses leave British shores due to this. People ask themselves, "Why did the UK go through all this trouble just to stay in the EU?" Uncertainty is bad for business. Why would you order goods from a country that might not be able to get them to you, or for the cost to double before they get to you? That is the current situation in the United Kingdom. The Bank of England estimates that the UK is losing £800 million a week in foreign capital post-Brexit. This amount of money is considerably greater than the lie that was the red bus of the Leave campaign, which stated that the UK government was giving £350 million a week to the EU. If you want to see the difference this makes when compared to the actual cost of Brexit, there is an option for that. What could we do with this money? We have given a few serious and a few less serious things that this money could have been spent on, to give you an idea of the social, environmental and infrastructural ills that could have been fixed. Remember to refresh the calculator to see how much more money has been lost since you arrived at this page! All conversions are accurate as of 14:44, 21/03/2019. Hanna Pamuła - PhD candidate and Jack Bowater. Brexit Cost Calculator can be embedded on your website to enrich the content you wrote and make it easier for your visitors to understand your message.